If you are looking to hire a Hummer Limousine in London, you have certainly come to the right place. A.T. Beauford have the vehicle here that you have been dreaming of for your wedding day. If you care about the comfort of your guests, bridesmaids, ushers and family, our Hummer Limousines provide a wonderful way to bring these people together and transport them to and from your wedding day at the same time. Our Hummer Limousines are available for hire throughout the London area, where we give you the added option of champagne too. A.T. Beauford’s 16 seater Hummer limousine is available in white, with a spacious interior for the comfort of your guests and important role players. Bridesmaids and Ushers will simply love our Hummer Limousine, travelling in or around London to your wedding destination. Our chauffeur driven service ensures all guests arrive safely and on time, where our drivers have excellent knowledge of the roads should we encounter traffic. Planning ahead, we can work with you to get the timings right and make sure there are no late arrivals. A.T. Beauford have been offering Hummer Limousine Hire in London for many years now, and in this time we have received some excellent feedback which you can view via our testimonials page. If you are would like to talk to someone about booking this magnificent motor, we encourage you to contact A.T. Beauford today and we can provide you with any extra information you need. Be sure to book early as with all of the wedding cars that we offer, our hummer limos are extremely popular too! 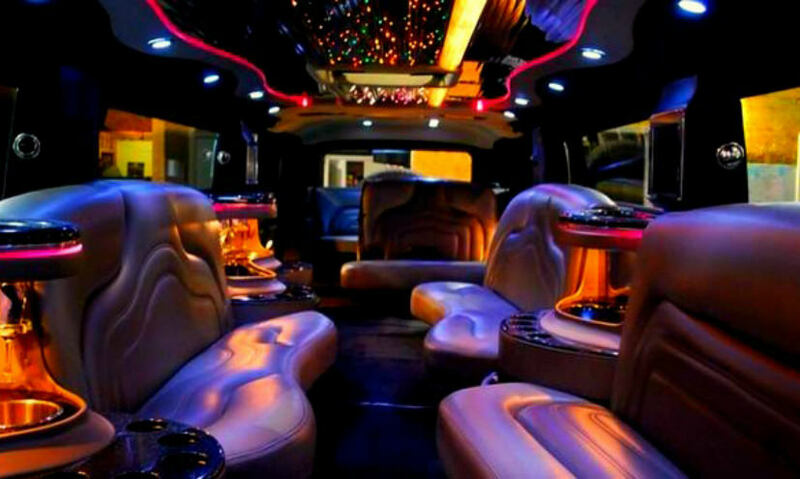 We have been offering Hummer Limousine hire in London for a number of years. When you choose to hire a Hummer limo from AT Beauford you’re guaranteed to receive a first-class service. The Hummer limo is one of the largest vehicles we offer as part of our wedding transportation range. The Hummer Limousine is renowned for its size and road dominance. 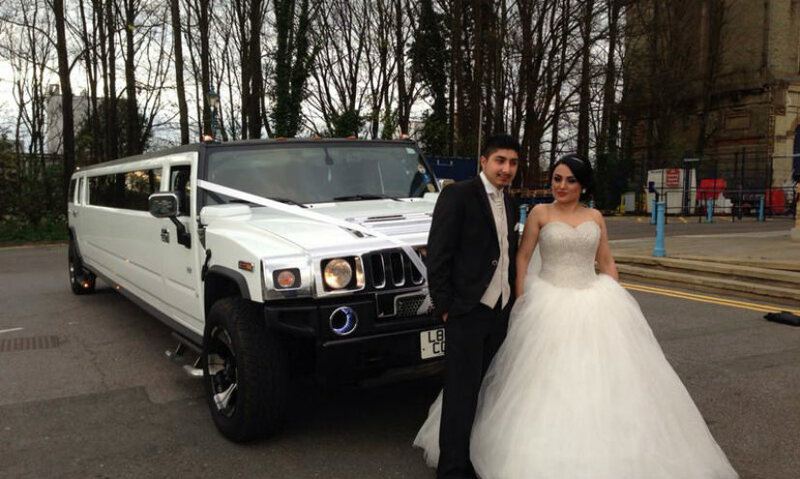 When you choose to hire the Hummer limo for your wedding day in the London area, you’re sure to be noticed. Whether it’s used as the main vehicle of transportation or as a secondary vehicle for the wedding party, the Hummer will fit perfectly into your wedding celebrations. Having offered the Hummer limo to customers throughout London for many years, we have developed a deep understanding of what people require for their wedding day. That’s why our chauffeur drivers will always go the extra mile to ensure your day is as special as it can be. When it comes to Hummer Limousine hire in London, please don’t hesitate to get in touch with AT Beauford. 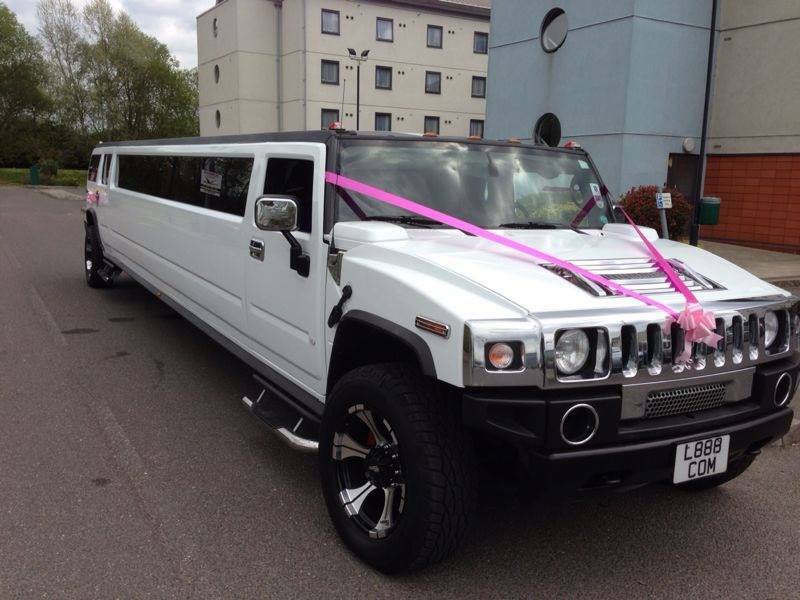 Hummer Limousine Hire is one of the most popular modern wedding transportation options for customers in and around London. With many couples using it as the main or secondary vehicle, you can easily fit all of your wedding party into the Hummer limo. The Hummer limo we have available for hire, offers a modern grey and black interior finish that is finished off with stylish adaptive lighting. With the exterior of the Hummer having a crisp white finish, it can easily blend into your wedding day or stand out from the crowd. 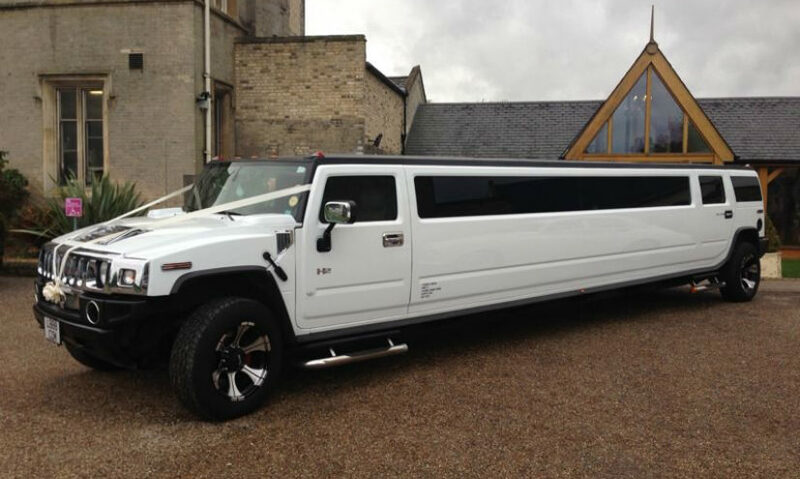 Should you be in interested in hiring a Hummer Limousine in London for your wedding day, then be sure to make AT Beauford your first port of call. When you choose to hire a Hummer Limo from us you’ll be in the hands of our professional chauffeur drivers who’ll ensure you arrive to your wedding on time. Why Choose The Hummer Limo? What is the seating capacity for the Hummer limo? The Hummer Limousine has a maximum seating capacity of 16. With a large stretch section 16 guests can enjoy the luxury of modern great leather seating and a stylish interior that comes with all the latest mod cons. How much does it cost to hire a Hummer limousine? We have a number of Hummer Limousine hire packages available to customers throughout London and the surrounding areas. 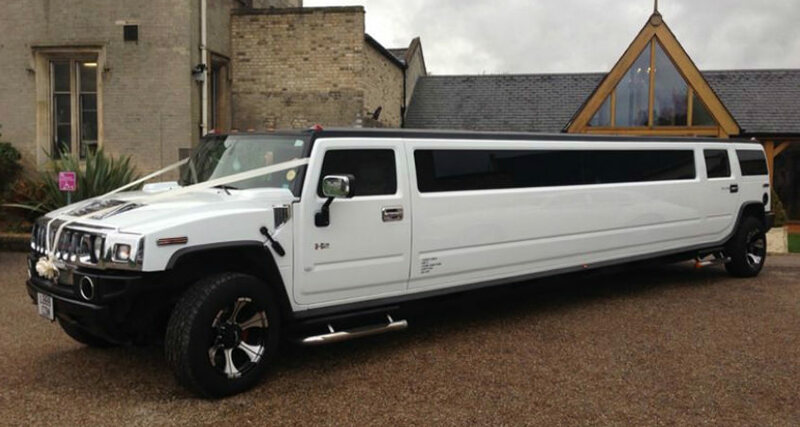 Get in touch with AT Beauford today and we’ll be happy to provide you with a quote for Hummer limo hire in London. Can you decorate the outside of the limo? Yes! When you choose AT Beauford to hire a Hummer limo from you’ll be able to take advantage of our free decoration service. The front of the vehicle can be decorated with a colour of ribbon that matches the theme of your wedding day. When it comes to Hummer limo hire in London or any of the surrounding areas, be sure to make AT Beauford your first port of call. The Hummer limousine we offer has provide transportation for many wedding parties over the years and we understand what is required when it comes to Hummer hire. When you choose AT Beauford for Hummer limousine hire in London, you’ll be in the safe hands of a professional and experienced chauffeur driver. Get in touch today and we’ll be happy to discuss you requirements for wedding transportation.